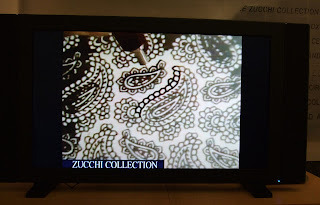 My visit to the Zucchi Print Block Museum in Milan was the most exciting part of my trip. They hold approximately 56,000 blocks which is 12,000 patterns. 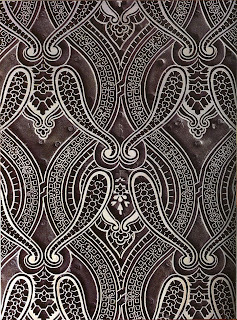 These came from several European block printing companies but mainly from David Evans in Crayford, Kent. (No longer in existence. Whilst on my Art Foundation Course, I organised a trip to David Evans, Silk Printers, Crayford, Kent. It was a profound experience for me and I arranged to work there for the summer. Whilst there, I absorbed the history of block printing, accepting gifts of blocks at all stages of making, of 'strike offs', of block printed silk, pattern books - treasures indeed. So much was just being destroyed. There were four block printers still block printing commercially, albeit for an elite market,, and I visited them, writing to them until they died. They became great friends. All of the blocks were being catalogued and sold (later to be collected by the Zucchi Museum in Milan. Some went to Beckford Silks in Gloucestershire.) I interviewed and taped the block printers. One, John Greenwood, insisted I could have any information which I could write down, and I wrote and wrote, taped, photographed and interviewed. Staff gave me personal photos and precious items. Each Friday, about a hundred staff were made redundant and I cried each week. It was the end of commercial block printing for ever. I photographed the block printers at work with their tierers on the last day as the last of them left. Some transferred to the screen printing section. The old pub was crowded on that Friday. We hugged and cried. Soon I was on the train home, tears staining my face, - a moment in history. On that last day of block printing, one of the block printers, Bernie Fielder, printed a scarf for me. I was rather fond of a series of blocks called 'The Bathers', an Art Deco design. He used these blocks with a border block, using the David Evans insignia block which was rarely used as they were contract printers. He also signed it with his personal block, also rarely used. So the very last piece of commercial block printing done that day was a treasured silk block printed scarf for me. Much later, at the end of my B.A. Degree, I wrote my thesis on my experiences, returning to David Evans on several occasions. One day when I arrived there, the buildings in which I had worked were being demolished and I took a series of photographs of the old water tower coming down, of the steam shed crumbling, exposing the huge sunken steamers, of the huge machinery destroying the dye rooms and other sections in which I had worked. The old block printers told me stories of how they met their wives there, often their teirer, (his assistant who smoothed the pad in which the block printer loaded his block with colour) and took them into the block sheds for 'a bit of fun', of how they would all be dressed in black top hat, bow ties, waistcoats and black suits in the pub after they had been paid on a Friday. The block printers were revered. They were skilled and looked up to. I have a collection of old cast irons and have a weasel. It is a long narrow cast iron used by the tailors, especially for sleeves. 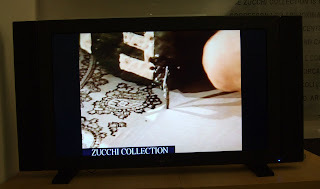 At the Zucchi museum, a film of Block Printing at David Evans was being shown and I was emotional to see those people I had worked with and had so much fun with. The first block to be printed is the 'Master' block. A die of the design is made and pewter poured into the mould. Sections of about 5 x 4 inches are expertly fitted together to form one fine line block. Often this would be printed in black. Each colour is 'engraved' in exactly the same way as you would create your Kodatraces or acetates for your screens. Engraving the Image. Courtesy of the Zucchi Museum in Milan. Taken from the film. Wooden carved block with felt infill - the Blotch. Zucchi Museum. There may be six or more blocks to a set. 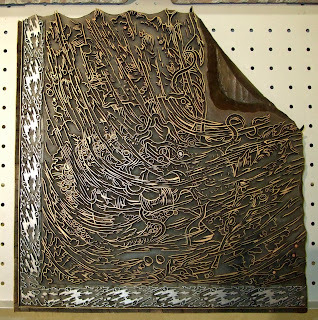 There are 4 types of construction, pewter casting (The Master), carved wooden blocks, carved wood with felt (The Blotch), brass and/or copper pins (picotage) or strips. This block is the Blotch, the main 'fill' block. 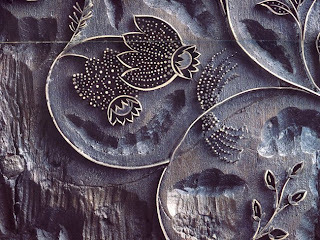 The wooden carved blocks were created with extreme skill, the apprenticeship being seven years with another seven years as an assistant and before becoming an expert block printer or maker. A wood carved and 'picotage' brass pin block. Each block has precise registration pins in each corner. If these are a fraction of a millimetre out, then the block printing will print at an angle. 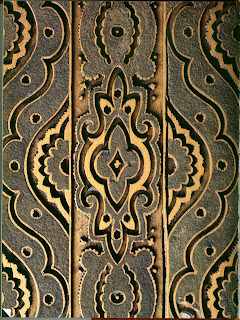 The pin marks are the only way to identify a piece of block printed fabric and they are hard to find. A brass strip corner block with a pewter border. These were square scarf blocks. This one is probably an Art Deco design.